Photo by AUDRY STEELMAN. 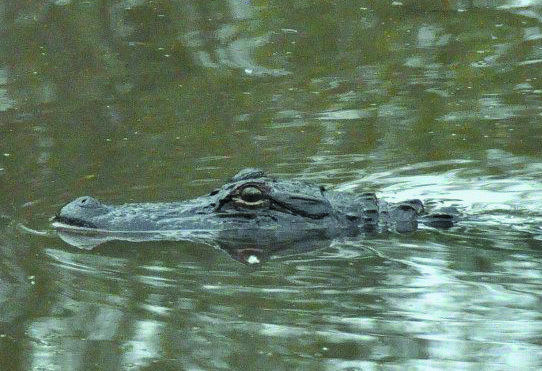 A picture of the alligator that has made itself at home in the pond behind Gary and Audrey Steelman’s home. Gary Steelman Jr. got more than a little bit of a jolt a couple of weeks ago. He was fishing in the pond the pond at his house at Stapp-Zoe and saw what appeared to be a big bullfrog. Steelman tried to snag it a couple of times without success. The third time was paydirt. Only it wasn’t a bullfrog. It was an alligator he estimates between four and five feet log. The alligator then created a little havoc trying to get unhooked. “I learned a few new cuss words when that happened,” Steelman said. He hollered at his wife, Audry, who was taking care of the cows. Since finding the alligator, the Steelmans have tried to keep their Labs away from the pond since they like to swim in it. They have posted video and pictures of the gator on Facebook and had Jeff Ford with the wildlife department come out to see it. Unfortunately, the gator was hidden that day and did not make an appearance. If it is determined to be an alligator, which is what the Steelmans believe, some representatives from McCurtain County will trap it and transport the gator back down south. However, if it turns out to be a crocodile or cayman, it will be the Steelman’s problem. Steelman said that Ford informed him that an alligator had also been seen near the Long Lake Resort and his parents found a baby near Reichert several years ago. As for how a gator got this far north, nobody knows. Steelman said he has a big map of the Ouachita Forests and noticed how close some of the creeks and rivers were to Haw Creek. While most people would be freaked out to have a gator living only yards from their home, it hasn’t caused a problem. He added that if the weather is nice, it is pretty easy to see the new pet. But if it is storming or raining, the gator hides out and can’t be seen.